The pedals are now installed along with the new brake lines and mats. The mats on the floor are NOS mats in good condition, rubber doesn't sit too well over 35 years in a basement so they are not perfect. The basket is a nice original accessory popular in Norway in the 1960s and comes in very handy as it has two spots for drinks and a large spot for traveling supplies. Plus it is easily removable. The little stuffed dog in the basket is a gift from my sister, it is a Ty Beanie dog she found named "Schnitzel". He is now the official restoration mascot! 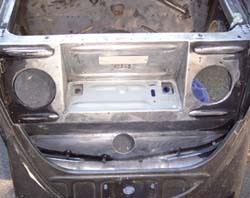 The shifter and handbrake have been reinstalled, the shift boot is an original gray VW boot and the knob is the original. You can see it has a little bit of discoloration on it from the sun, but it is a very nice boot still. The hand brake sports an original style reproduction accessory ivory cover and an NOS button. I still have to fill the transmission with oil and add the wheels, but otherwise it is done. 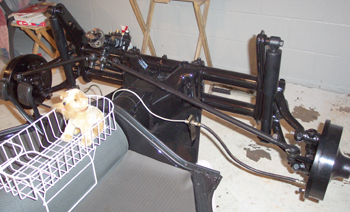 The transmission was degreased by me in May and the axles painted with POR-15 also. The wheels are at the body shop now being painted in their original colors. I blasted them in our cabinet at home, and my husband replaced two of the hubcap clips on the spare. The new tires are five wide white wall RADIAL tires from Coke. After driving Schnitzel on bias ply tires for a few years these are a welcome change when driving over the open grate bridges crossing the Delaware. Colors are L41 Black and L87 Pearl White on the rims, tires were installed by Foreign Magic right in Frenchtown where Bill took special care not to scratch them, he also mounted the weights on the inside of the rims, and labled the wheels for spare, fronts and rears as 3 of the five rims were bent. A fantastic job as always by Foreign Magic. The new wheels were mounted by me, and I am ready to go for a ride now. Well.... maybe I should wait for a seat... and an engine.... and brake fluid.... hmmm maybe we will just roll it outside. 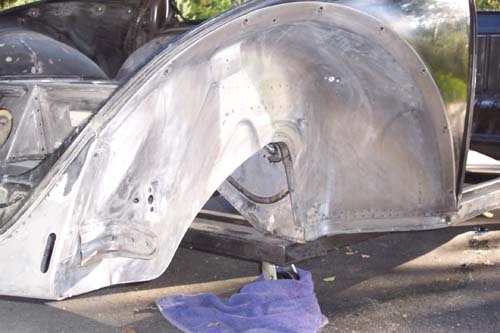 I started sanding with the trunk area, the goal was to get it down to bare metal to make sure that there was no hidden surprises. 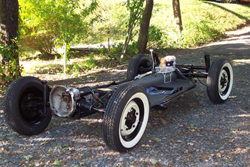 Schnitzel has been painted only once during his time on the road other than the original paint. The paint in the trunk is mostly original, except for where I had holes welded up from a gas heater. 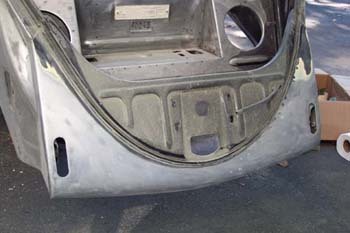 One of the nastiest spots in most Beetles is the brake fluid area, here I have it cleaned and the metal derusted. Another tricky spot is the tire well, almost always a rust covered spot. Here is has been cleaned, there are two drilled holes in the bottom of it (to drain water) and a crack in the metal running between them. I am just going to leave the crack in the metal as it is. There are also several dents in the bottom from the past drivers and whatever they ran over, these wounds will also be left as is. The front firewall area is in fine shape, not a sign of damage or rust. Just a lot of dirt, undercoating and old paint to sand off here. I was really impressed with the front apron, I kept expecting to see something covered up here. But nothing showed up here, just a perfect front apron. Even the seal clamp all the way around the trunk is in perfect shape with no rust. The fender wells were equally impressive. First I stripped the undercoating off with chemical stripper, it only took a few minutes to brush it on and wipe it off with paper towels. The undercoating comes off very easily, then I sanded it down and viola! A perfect fender well! I finished the sanding with the air sander on the body, taking it down to the original metal. 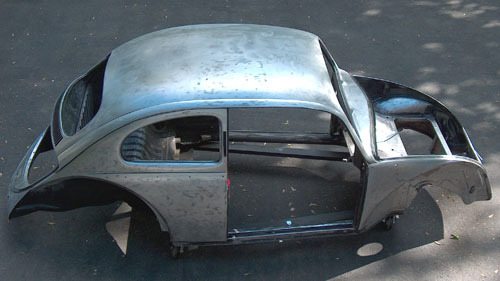 Schnitzel is naked now, and there was amazingly little body work done in the past on him. Just two tiny spots of filler on the driver's side about a half and inch in size and a little spot on the rear apron also. I have two small dings on the roof to fill, one small one on the front passenger quarter panel and one tiny ding on the front and rear apron each. Schnitzel had a few rust spots that will have to be treated with POR-15, the metal is still solid and just need to be cleaned up, there is one hole in the left side you can see all the spots in the above pictures that will need to be repaired. There is one more hole on the underside of the right heater channel up in the front about the same size near a bolt hole. The rest is good metal.